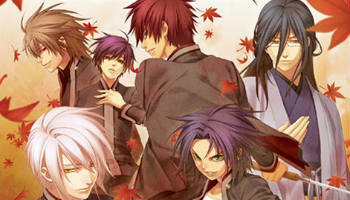 Hiiro no Kakera (Scarlet Fragment) is a Japanese anime television series by Studio Deen. It is based upon the Visual Novel series of the same name. It has also been adapted into a one volume manga. The story starts when a young girl named Kasuga Tamaki is summoned by her Grandmother to the small village where she lives. Things turn weird immediately when strange creatures appear before Tamaki in the woods. Well, it turns out that the women in Tamaki’s family are basically in charge of protecting the world and Granny feels that it's time to pass the torch to Tamaki. Not to worry though as she has got a little help; namely a a magical little fox and several young men from the family whose ancestral duty is the protection of the Tamayorihime. Yes, this is a Shoujo series, how did you guess? Big Badass Wolf: Ryou Kutani. Cold Flames: Yuuichi's favorite method of attack. Curb Stomp Battle: Actually, the Big Bads do it to the good guys way more often than the other way around.....until End Game. The Hero: Suguru Oomi, the unofficial leader of the guardians. The Smart Guy: Yuuichi Komura, hell Tamaki first meets him in the library where he is reading a book. The Big Guy: Takuma Onizaki, has plenty of raw power and more than a little difficulty controlling it. Sixth Ranger: Ryou Kutani, isn't part of the group to begin with and often acts like a lone wolf. Kitsune: Komura is descended from one. Master of Illusion: Yuuichi Komura is descended from a nine-tailed fox, so yeah, the fact that he is good with illusions is kind of a given. The Napoleon: Atori and he is not happy about it. Urban Fantasy: The story takes places in modern day Japan. White-Haired Pretty Boy: Yuuichi Komura, complete with Eyes of Gold. Wouldn't Hit a Girl: Mahiro, to the point where when Tamaki calls him an elementary school student, he tries to hit Takuma, who said nothing. This page was last edited on 17 July 2018, at 14:09.